Library Chronicles: Leaving so soon? That's the Superdome sometime in the fourth quarter yesterday. 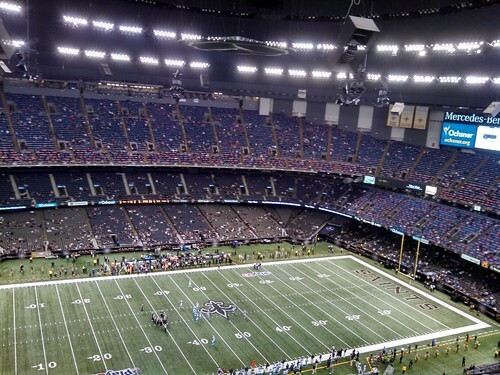 It's only slightly more empty than was the Superdome just after halftime. Where did everybody go? One assumes the majority of them had arrived on Sunday afternoon having blocked out enough of their schedule to account for the game's duration. Did something come up? 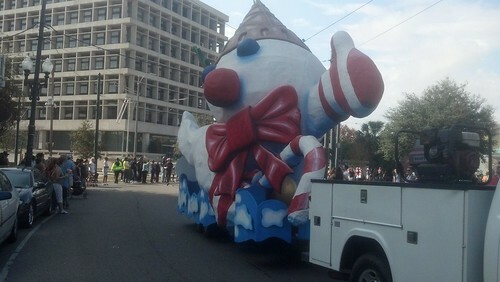 The Mr. Bingle parade was on Saturday. I really don't know what everyone suddenly thought they were missing. Maybe the problem is too many Saints fans don't understand football. Maybe they've gotten so used to the past eight years of (mostly) yelling and being obnoxious and.. exhibiting "swagger" over the exploits of a (mostly) competitive team that they've forgotten there's more to football than that. A lot more, actually. Personally, I've had a lot of fun watching this year's team play. They're hilariously unpredictable. Their record is terrible but they're still in contention. They've lost four consecutive home games (historically significant in its own right) but the Superdome fan experience has rarely been as entertaining for... a number of amusing reasons. I'm going to expound on those later on in a separate post. But, speaking specifically about yesterday, people need to better understand the value of hanging around to watch the wheels come off. Sure, losing feels different than winning but it is no less interesting. And, if you're in the stadium, there is still plenty to see and do. To begin with, these player's aren't going to boo themselves. Well, OK, some of them are, actually. In Strief’s eyes, he and his fellow Saints (5-8) deserved nothing less as they took a 41-10 pounding from the Panthers (4-8-1), who hadn’t won since Oct. 5. Guys, Zach Strief says the team needs you there to boo and jeer at them! Why would you let them down? They also need you there to throw things. This toss, combined with the children participating in the halftime punt, pass, and kick exhibition.. oh.. and the lady who made the "cash catch".. constituted the highlights of the day for the home team's passing game. I also noticed the first paper airplanes I'd seen launched from the terrace in a while. (Unless we count this glut of gliders brought on by a stupid "card stunt" before the Dallas game last season which we won't because they were just asking for that one.) Saints fans aren't as good at those as I remember. We're out of practice. You guys should have stayed to work on that. Hell even Ralph Malbrough took off early citing some sort of old man wisdom he claims to have picked up somewhere. NEW ORLEANS - My mom and I have had Saints season tickets for 25 years and for the first time ever we left a New Orleans Saints game in the third quarter. When the Carolina Panthers scored to make it 31-3 I turned to her and said, "I've seen enough to know I've seen too much." And to the exits we went. I stayed though. I'd seen enough to know that I was seeing something I had not seen in a long time and I wanted to stick around so I could remember what that was like. It was interesting! Menckles kept banging on the wall long after we were the only two fans remaining in our section. I had a headache but I didn't tell her to stop. It seemed appropriate. Sometime midway through the fourth quarter they finally stopped cranking that terrible third down siren effect every Saints fan hates. But there was a stretch of the third quarter where they were playing it at full volume to a mostly empty and dead silent Dome that was the height of sublime humor. Dome teams are often accused of using the PA system to pipe in artificial crowd noise in order to disrupt opposing offenses. Yesterday the Superdome figured out a way to pump in additional irony. It enhanced the experience. Judging from that empty Superdome, Saints fans could use all the good humor injections they can get right now. There's something sort of snotty or entitled about leaving a game early. At the very least it belies a limited understanding of the entertainment you have paid to observe. It's a strange thing to just expect that your team should win all or even most of the time. At the pro level, there is so little difference in talent between the "good" and "bad" teams that what separates the wins from the losses is often just a string of coincidences. That's not exactly true, of course. There are marginal differences in talent among pro players and teams which we can talk about. But it's more true than people often admit. A lot of this stuff is just random. But that, in itself, is what makes it so much fun. Being a fan is about rooting for your team to win, yes, but it's as much about appreciating the absurdities that determine whether or not they can. Drama can be comedy or tragedy. But the genre shouldn't inform us directly about the quality. And with three games left to play, the 2014 Saints could still qualify as either! This is one of the most bizarre programs I've ever had the pleasure of sitting (all the way) through. And, especially if the Falcons lose tonight, I see no reason why that should change. Update: Besides, the sooner the football season ends, the sooner the math season begins. And nobody wants that.